The Thelonious Monk Biography shows us that individuality defines a true Jazz Cat... Thelonious Monk fits that bill! When you follow the Thelonious Monk Biography you come to the realization that Thelonious Monk is recognized as one of the most inventive pianists of any musical genre, Monk created a startlingly original sound that even his most devoted followers have been unable to successfully imitate. Born on October 10, 1917, in Rocky Mount, North Carolina, Thelonious was only four when his mother and his two siblings, Marion and Thomas, moved to New York City. Unlike other Southern migrants who headed straight to Harlem, the Monks settled on West 63rd Street in the “San Juan Hill” neighborhood of Manhattan, near the Hudson River. His father, Thelonious, Sr., joined the family three years later, but health considerations forced him to return to North Carolina. During his stay, however, he often played the harmonica, ‘Jew’s harp,” and piano--all of which probably influenced his son’s unyielding musical interests. Young Monk turned out to be a musical prodigy in addition to a good student and a fine athlete. But the dude went to the music because he felt it in his bones! He studied the trumpet briefly but began exploring the piano at age nine. He was about nine when Marion’s piano teacher took Thelonious on as a student. By his early teens, he was playing rent parties, sitting in on organ and piano at a local Baptist church, and was reputed to have won several “amateur hour” competitions at the Apollo Theater. Admitted to Peter Stuyvesant, one of the city’s best high schools, Monk dropped out at the end of his sophomore year to pursue music and around 1935 took a job as a pianist for a traveling evangelist and faith healer. The cat thought school was holding him back fro his dreams of being a professional musician! Returning after two years, he formed his own quartet and played local bars and small clubs until the spring of 1941, when drummer Kenny Clarke hired him as the house pianist at Minton’s Playhouse in Harlem. Minton’s, legend has it, was where the “bebop revolution” began. The after-hours jam sessions at Minton’s, along with similar musical gatherings at Monroe’s Uptown House, Dan Wall’s Chili Shack, among others, attracted a new generation of musicians brimming with fresh ideas about harmony and rhythm--notably Charlie Parker, Dizzy Gillespie, Mary Lou Williams, Kenny Clarke, Oscar Pettiford, Max Roach, Tadd Dameron, and Monk’s close friend and fellow pianist, Bud Powell. These dudes were creating a true art-form and Monk was right there at the beginning adding his "color" to the painting! Monk’s harmonic innovations proved fundamental to the development of modern jazz in this period. Anointed by some critics as the “High Priest of Bebop,” several of his compositions (“52nd Street Theme,” “Round Midnight,” “Epistrophy” [co-written with Kenny Clarke and originally titled “Fly Right” and then “Iambic Pentameter”], “I Mean You”) were favorites among his contemporaries. Yet, as much as Monk helped usher in the bebop revolution, he also charted a new course for modern music few were willing to follow. 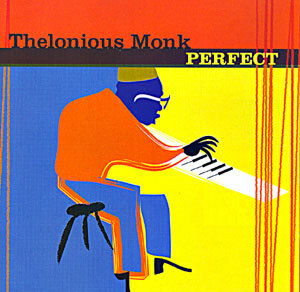 Whereas most pianists of the bebop era played sparse chords in the left hand and emphasized fast, even eighth and sixteenth notes in the right hand, Monk combined an active right hand with an equally active left hand, fusing stride and angular rhythms that utilized the entire keyboard. And in an era when fast, dense, virtuosic solos were the order of the day, Monk was famous for his use of space and silence. He was an "abstract artist" if you look for a word to describe the dude! In addition to his unique phrasing and economy of notes, Monk would “lay out” pretty regularly, enabling his sidemen to experiment free of the piano’s fixed pitches. As a composer, Monk was less interested in writing new melodic lines over popular chord progressions than in creating a whole new architecture for his music, one in which harmony and rhythm melded seamlessly with the melody. He was looking to "build"... not re-create" the cat was simply put: an "original visionary"! Despite his contribution to the early development of modern jazz, Monk remained fairly marginal during the 1940s and early 1950s. 1944 tenor saxophonist Coleman Hawkins was the first to hire Monk for a lengthy engagement and the first to record with him. Most critics and many musicians were initially hostile to Monk’s sound. Blue Note, then a small record label, was the first to sign him to a contract. People were shocked by this weird cat bringing a new way of playing the keys! Thus, by the time he went into the studio to lead his first recording session in 1947, he was already thirty years old and a veteran of the jazz scene for nearly half of his life. But he knew the scene and during the initial two years with Blue Note had hired musicians whom he believed could deliver. Most were not big names at the time but they proved to be outstanding musicians, including trumpeters Idrees Sulieman and George Taitt; twenty-two year-old Sahib Shihab and seventeen-year-old Danny Quebec West on alto saxophones; Billy Smith on tenor; and bassists Gene Ramey and John Simmons. On some recordings Monk employed veteran Count Basie drummer Rossiere “Shadow” Wilson; on others, the drum seat was held by well-known bopper Art Blakey. The cat wanted original "thinkers" just like him... but it was his band and his show"! His last Blue Note session as a leader in 1952 finds Monk surrounded by an all-star band, including Kenny Dorham (trumpet), Lou Donaldson (alto), “Lucky” Thompson (tenor), Nelson Boyd (bass), and Max Roach (drums). In the end, although all of Monk’s Blue Note sides are hailed today as some of his greatest recordings, at the time of their release in the late 1940s and early 1950s, they proved to be a commercial failure. The jazz heads were just not ready for Monks "out there" kind of music.. but they eventually caught up to him! Harsh, ill-informed criticism limited Monk’s opportunities to work--opportunities he desperately needed especially after his marriage to Nellie Smith in 1947, and the birth of his son, Thelonious, Jr., in 1949. Monk found work where he could, but he never compromised his musical vision. His already precarious financial situation took a turn for the worse in August of 1951, when he was falsely arrested for narcotics possession, essentially taking the rap for his friend Bud Powell. Deprived of his cabaret card--a police-issued “license” without which jazz musicians could not perform in New York clubs-- Monk was denied gigs in his home town for the next six years. Nevertheless, he played neighborhood clubs in Brooklyn--most notably, Tony’s Club Grandean, sporadic concerts, took out-of-town gigs, composed new music, and made several trio and ensemble records under the Prestige Label (1952-1954), which included memorable performances with Sonny Rollins, Miles Davis, and Milt Jackson. In the fall of 1953, he celebrated the birth of his daughter Barbara, and the following summer he crossed the Atlantic for the first time to play the Paris Jazz Festival. During his stay, he recorded his first solo album for Vogue. These recordings would begin to establish Monk as one of the century’s most imaginative solo pianists. And once again we see how Europe saved some of the most creative jazz cats... who were disregarded on their own shores! In 1955, Monk signed with a new label, Riverside, and recorded several outstanding LP’s which garnered critical attention, notably Thelonious Monk Plays Duke Ellington, The Unique Thelonious Monk, Brilliant Corners, Monk’s Music and his second solo album, Thelonious Monk Alone. In 1957, with the help of his friend and sometime patron, the Baroness Pannonica de Koenigswarter, he had finally gotten his cabaret card restored and enjoyed a very long and successful engagement at the Five Spot Café with John Coltrane on tenor saxophone, Wilbur Ware and then Ahmed Abdul-Malik on bass, and Shadow Wilson on drums. From that point on, his career began to soar; his collaborations with Johnny Griffin, Sonny Rollins, Art Blakey, Clark Terry, Gerry Mulligan, and arranger Hall Overton, among others, were lauded by critics and studied by conservatory students. Monk even led a successful big band at Town Hall in 1959. It was as if jazz audiences had finally caught up to Monk’s music. By 1961, Monk had established a more or less permanent quartet consisting of Charlie Rouse on tenor saxophone, John Ore (later Butch Warren and then Larry Gales) on bass, and Frankie Dunlop (later Ben Riley) on drums. He performed with his own big band at Lincoln Center (1963), and at the Monterey Jazz Festival, and the quartet toured Europe in 1961 and Japan in 1963. In 1962, Monk had also signed with Columbia records, one of the biggest labels in the world, and in February of 1964 he became the third jazz musician in history to grace the cover of Time Magazine. What a tribute to an original dude who hung in there with his own vision and did not copromise one iota! However, with fame came the media’s growing fascination with Monk’s alleged eccentricities. Stories of his behavior on and off the bandstand often overshadowed serious commentary about his music. The media helped invent the mythical Monk--the reclusive, naïve, idiot savant whose musical ideas were supposed to be entirely intuitive rather than the product of intensive study, knowledge and practice. Indeed, his reputation as a recluse (Time called him the “loneliest Monk”) reveals just how much Monk had been misunderstood. As his former sideman, tenor saxophonist Johnny Griffin, explained, Monk was somewhat of a homebody: “If Monk isn't working he isn't on the scene. The fact is, the Monk family held together despite long stretches without work, severe money shortages, sustained attacks by critics, grueling road trips, bouts with illness, and the loss of close friends. During the 1960s, Monk scored notable successes with albums such as Criss Cross, Monk’s Dream, It’s Monk Time, Straight No Chaser, and Underground. But as Columbia/CBS records pursued a younger, rock-oriented audience, Monk and other jazz musicians ceased to be a priority for the label. Monk’s final recording with Columbia was a big band session with Oliver Nelson’s Orchestra in November of 1968, which turned out to be both an artistic and commercial failure. Columbia’s disinterest and Monk’s deteriorating health kept the pianist out of the studio. In January of 1970, Charlie Rouse left the band, and two years later Columbia quietly dropped Monk from its roster. For the next few years, Monk accepted fewer engagements and recorded even less. His quartet featured saxophonists Pat Patrick and Paul Jeffrey, and his son Thelonious, Jr., took over on drums in 1971. That same year through 1972, Monk toured widely with the “Giants of Jazz,” a kind of bop revival group consisting of Dizzy Gillespie, Kai Winding, Sonny Stitt, Al McKibbon and Art Blakey, and made his final public appearance in July of 1976. Physical illness, fatigue, and perhaps sheer creative exhaustion convinced Monk to give up playing altogether. On February 5, 1982, he suffered a stroke and never regained consciousness; twelve days later, on February 17th, he died. 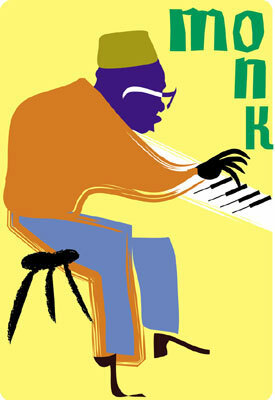 Today Thelonious Monk is widely accepted as a genuine master of American music. His compositions constitute the core of jazz repertory and are performed by artists from many different genres. He is the subject of award winning documentaries, biographies and scholarly studies, prime time television tributes, and he even has an Institute created in his name. The Thelonious Monk Institute of Jazz was created to promote jazz education and to train and encourage new generations of musicians. It is a fitting tribute to an artist who was always willing to share his musical knowledge with others but expected originality in return. The sign of a true Jazz Cat is his reluctance to take the easy way out of hardship... instead of giving up, they find a way to create... Monk was that kind of cat! Back to Thelonious Monk Biography and other Jazz Cats!